Watching a much-awaited movie in the cinema with your family or friends signifies that you are having an amazing weekend. However, the experience could have been better if you could have enjoyed the movie at your home theater, saving you the hassle of waiting in queues for tickets and pop corns while allowing you to enjoy the cinematic experience in all its glory right within the comfort of your own home. When it comes to having a personalized home theater system, many people say that it usually lacks the exclusive cinematic effect. This happens because most people spend all their time and money choosing a screen, amplifier, DVD player, and other related equipments. One important thing they usually over look is seating. The experience is incomplete without the right seating. The size, design, fabric, color, etc of the home theater seating play a significant role in determining the quality of experience you end up with. However, people usually don’t know how to choose the perfect theater seats and end up at buying inappropriate chairs that ruin the experience for them. 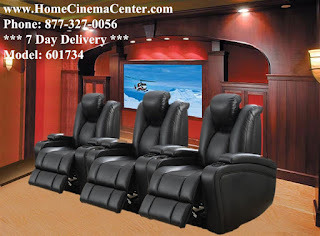 In order to help you with home movie theater seating, here, we present you a comprehensive guide on how to go on about buying the best seating for your home theater. The first thing to determine prior to buying home theater seating is the size of your room. Measuring the dimensions of the room makes it easier to decide what type and size of the chairs you should opt for. Purchasing bigger seats than required brings two major disadvantages. Firstly, it becomes difficult to accommodate them with a fine setting, and secondly, bigger seats absorb too much sound, which disturbs the sound effects of the movie. One major reason that movies at cinemas appear more thrilling and satisfying is the fact that the cinema people select and design everything as per the size of the screen. Knowing the screen size helps in identifying the possible angles and arrangements for optimal viewing, that is, not too close or too far- as Goldilocks would say it: ‘just right’. Once the size of the room and screen has been measured, the next thing that comes is the type of the seating you want for your home theater. Sofas, chairs, couches, recliners, or something else – there are several options to select from. Regardless of the type you end up going for, keep in mind the level of comfort it offers. You would never want to keep changing seating angles throughout the movie to get comfortable, especially during the climax. How well the seats compliment the theme of the room is just as crucial as any other aspect of the home theater seating. Therefore, choose the color and material of the chairs wisely. They should match to the pattern and color of your room walls and should look captivating.